Did you know that thanks to the contributions of our readers, we have been able to maintain complete independence? This means that we do not accept support from any private foundations, which now more than ever are seeking to control and manipulate the alternative news media. Instead, our news coverage comes from a multitude of diverse perspectives to ensure you get the true big picture of what’s happening in the world. Through our extensive networks of dedicated contributors, readers and volunteers, we are able to keep our operating costs as low as possible. However, mobilizing to meet the increasing demand for truth in media means that we need to meet rising expenses. To that end, Global Research recently initiated a Fund Raising Campaign with the intention to raise $15,000. We thank everyone who has answered the call by sending in donations, creating memberships and spreading the word to friends and colleagues. Now is the time to push ahead to meet our fundraising goals, and we need your help! Global Research has become one of the leading alternative news media in North America. 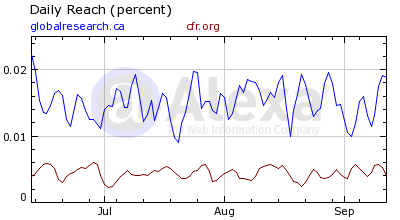 Globalresearch.ca has more than 2.2 million hits (page views) on a monthly basis, approximately one million visits and 550,000 “absolute visitors” (Google Diagnostics). Our E-Newsletter is sent out to more than 23,000 subscribers. A significant number of Global Research readers among several hundred thousand readers have donated to Global Research and we are much indebted for their support. Kindly cross-post and/or forward Global Research articles (including this message), post them on your blog sites, on Facebook and on Twitter, submit them to internet discussion groups, send them to your friends on your e-mail lists, etc. This will help Global Research in its endeavors. 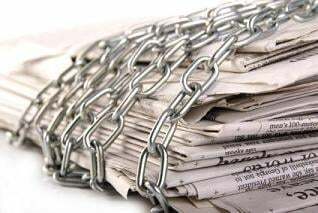 Widespread distribution of Global Research articles is a means to reversing the tide of media disinformation.